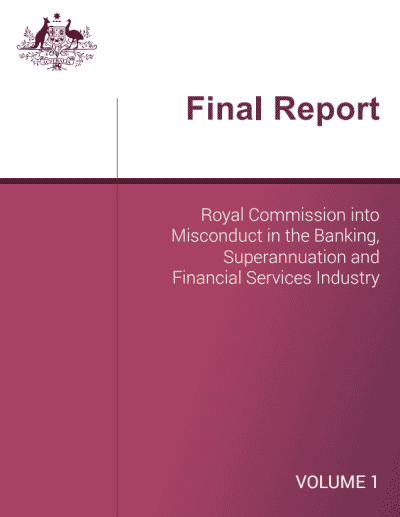 The Royal Commission into banking, superannuation, and the financial services industry came out at 4.10pm today No doubt within our bubble of financial services all my conversations with peers will be around this, and the increasing education requirements (FASEA). I wanted to touch base as I think you will hear a bit about this and wonder how it will impact you. The report is 510 pages long so it will take a while to get through and report back to you on what is happening. Click here to download the entire report. It is a very comprehensive review of the whole financial system so the implications are far beyond just financial advice, and the recommendations could impact you through insurances and lending also. We will see what gets implemented and what does not. It will be an interesting next few months with an upcoming election in May. If you have any questions please feel free to contact us.